This recipe ended up being a bit of a spur of the moment thing, but it all worked out. I originally envisioned this to be a cold salad, but I realized that making the dressing would be easier if I heated it up, and then it morphed into a warm meal. So glad I went this route. These garlic lime cashew zoodles are surprisingly filling. I only managed to eat half the bowl pictured, and it’s not even a huge bowl. The cashews as well as the peanut butter in the sauce provide plenty of substance. I had this as an entree, but I also think it would work as a side dish. I spiralized the carrot on the thinnest setting, so it cooks really fast. The zucchini is spiralized on the medium setting and the zoodles are nicely “al dente” when cooking is done. The easiest way to cook this is by continuously tossing everything in the pan with tongs (or use two spoons) so the zucchini doesn’t overcook and everything gets heated through nice and evenly. You only cook the zoodles for about 4-5 minutes, so this recipe is perfect for busy weeknights! The sauce is a combination of garlic, sriracha, hoisin sauce, soy sauce, lime juice, and peanut butter. As the zucchini noodles release water, it becomes more liquid, coating everything with fantastic flavor. A sprinkle of cilantro at the end is all that’s needed to complete this super easy meal. Did you know that in the UK they refer to zoodles as “courgetti”? I found that out the other day, and I like it! They refer to zucchini as “courgettes”, and of course it’s a play on “spaghetti”. Clever. If you’re into quick spiralizer recipes, you may also like my 15 minute garlic shrimp zoodles recipe. 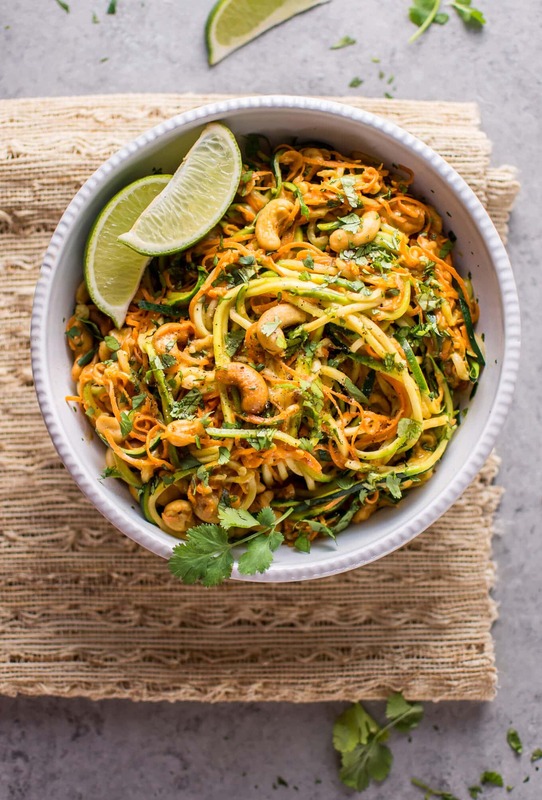 These 15 minute garlic lime cashew zoodles are a super easy and healthy vegan meal option. Spiralize the carrots on the thinnest setting, and spiralize the zucchini on the medium setting. Set aside. Add the peanut butter, hoisin sauce, sriracha sauce, soy sauce, lime juice, and garlic to a skillet on medium-high heat. Stirring constantly, cook it for about 2 minutes or until the garlic has just started to cook. Add the cashews, zucchini, and carrots. Using tongs or two large spoons, gently toss/lift up the pan contents every 10-20 seconds or so for about 4-5 minutes until everything is lightly cooked and heated through. The zucchini will release some liquid, which will help to make a nice sauce. When it's almost ready, add the cilantro in and toss. Serve immediately. The zucchini I bought from the grocery store were fairly skinny and around 6-8 inches long. Keep in mind that home-grown zucchini is typically a lot larger. Be careful not to overcook this dish, or it'll end up a watery mess. This looks delicious Natasha. Glad you opted to make it a warm meal.The sauce sounds fabulous! I’ve never really wanted a Zoodle maker until now. This dish has made me want to buy one! How do you think this would be with almond butter instead of peanut butter?? I was scanning for dessert recipes, but this one caught my eye and I had to dig in. I love zucchini noodles and believe it or not, my kids love them too! And with a healthy meal like this, I can feel less guilty about all the sweets I feed them. Thanks! Well that’s good! Let me know if they enjoy this. I would think cashew butter would also work well for this dish…going to try since I am allergic to peanuts! This looks amazing! Will be on the menu for this weekend! I just made this tonight and it was AMAZING!!! i threw on some chopped green onions too. so, yummy. fantastic recipe! This was our first attempt at zoodles and it was easy and delicious! Felt like a comfort food but healthier. Loved it! Yay!! So glad it worked out. What type of spiralixer did you use? I don’t seem to have any luck spiralizing carrots and I have 3 kinds of spiralizers. Hi Connie, they can be a bit tricky. I have the Paderno one. I always cut the carrot into a few pieces first, and I try to buy the largest carrots I can find. Hi Natasha, have you ever tried making this recipe and saving it for the next day? I’m wondering how it holds up and reheats. Thanks! Hi Fawn! I have, actually, and it goes a bit limp and watery. It still tastes fine, but I wouldn’t recommend it unless you absolutely have to. I have made this recipe a few times, and it is absolutely fabulous! It has rapidly became one of my favorite recipes. The last time I made it, I increased the amount of sauce and added tofu, it was delicious! Thanks for sharing. Did you use raw unsalted cashews, or just the kind you usually snack on? Hi Susan! I buy the unsalted cashews from the bulk bins of the grocery store. Pretty sure they’re roasted. Hoisin sauce is NOT gluten free. Specialty stores will carry GF hoisin sauce but you must be careful to ensure that the label is marked GF. Hi Alice, where did I mention that this recipe is gluten-free? In any case, thanks for the tip. I came here from Pinterest, and I think I see the misunderstanding – they’re referred to it as “Vegetarian and gluten-free”. Not your mistake, the mistake of whoever pinned it. Ah ok. I was wondering if that could be it! Another reason could be because Pinterest pulls recipe info from websites and sometimes things go wrong when they generate the descriptions for their “rich pins”. Do you have any nutritional information on this dish, maybe Cal’s, carbs, sugar etc…looks yummy but just wondering how I could fit this into my diet. Do you think this would work with chunky peanut butter and no cashews? I think you could definitely give it a go! It’ll be less filling, but that’s ok. Enjoy! Do you think grill shrimp would work well in this dish? If so what spice would you put on the shrimp for grilling? Also, I would like to make this for 10 people. Do you think that is too many as far as cooking the zoodles? Hi Catherine! Yes, I think grilled shrimp would definitely work. My tequila lime grilled shrimp would go well, so that’s an idea – here’s the link: https://www.saltandlavender.com/tequila-lime-shrimp/ or else you could just do something like a Cajun or Southwest seasoning. 10 people sounds like a lot. I worry a bit because you’d have to make it in batches, and this dish can get a bit watery if you let it sit for too long. Yum yum yum. Perfect flavor profile. I added scallions and celery. It was so filling and delicious. So happy to hear that, Tyra!! Thanks for leaving a comment. You’re welcome! Those modifications sound delicious. Very good. I was worried at first because it seemed too dry but yes, the juice from the zucchini cooking turned it into a nice sauce. Thank you! Thanks, Sandra! Yeah, zucchini release a LOT of water. I find many zoodles recipes to be too watery, so I tried to take advantage of that in this recipe haha. This was phenomenal! Thanks for sharing the recipe ❤️ No changes made perfect just how it was! I really love this recipe uncooked. I just toss the dressing on the spiralized veggies, sprinkle the cilantro and cashews over top and eat it as a salad. Yum! Loved this recipe. Only issue I had was that my peanut butter did not melt like yours did in the video. It kind of just clumped up and wouldn’t separate. I had to add water to it. Any advice on this? Loved the recipe. I had an issue though. My peanut butter didn’t melt like yours does, rather it clumped together and I had to add water to try turn it to paste. My peanut butter was a Co-op brand product. Any advice on this? Hmmm… the first 2 thoughts that came to my mind is that 1) is it a natural peanut butter? I used a creamy peanut butter (Kraft). 2) Did you cook it on high enough of a heat? I’m glad you still liked the recipe and were able to troubleshoot at least! Thanks for responding Natasha! Will get a creamy one and let you know how it went. Hmm I’m confused too! That is strange. I’ve made this several times the same way as the recipe is written, and that never happened to me. I’m now thinking if you’re willing to try it again, maybe a lower heat would be better? But I’m puzzled since I always cook it on a fairly high heat. Sorry it didn’t work for you! Yum yum yum! Just made this for our dinner…… one for the book for sure! Awesome!! So happy you liked it. Just made this and ate the whole thing. I felt like I was eating a yummy asian dish. The zoodles really tasted like noodles, the sauce was great and the cashews are what made it awesome! Thanks for the great dinner recipe! Thank you for this recipe! It is delicious and easy. Would it work to freeze leftover portions of this meal or would it become mush once defrosted and reheated? I’m pretty sure it would become mush. I haven’t frozen it before, but I have re-heated it, and it isn’t as good as when it’s first made since the zucchini continue to release water. I wasn’t in the mood for zoodles when I picked out this recipe, but still didn’t want to go full noodle. I ended up using tofu shirataki noodles, and it was delicious! I drained and rinsed the noodles, and then boiled them for 3 minutes before adding them to the sauce. I tweaked the amount of sauce halfway through (about 1.5 times the amount in the recipe) because not all of the noodles were coated. Even though the noodles don’t give off much water, the sauce was the perfect amount of sticky–I think this was due to the oils in my natural peanut butter. Next time I make this, I think I’ll use half zoodles and half shirataki. Thank you for this terrific recipe. This receipe was fantastic! I didn’t have Hoisin, so I subbed Teriyaki sauce. It was excellent, and my husband went back for heaping seconds. I use natural peanut butter, so my “sauce” was a thick clump in the wok to start, but the water released by the zoodles was just enough to make a perfect sauce texture by the time it was cooked (8 minutes in the open wok). Adding to my list of go-to week night dinners! Thank you! I didn’t have the tool to create zoodles so instead cut my vegies into small chunks which still tasted fantastic. I can’t wait to try this with the zoodles instead. I don’t have a spiraler but the market by me sells them prespiraled. Would you said you used a lb of zucchini and carrots? I can’t wait to try this! This was delicious!!! I didnt have any cashews so I just threw in the nuts I did have (almonds) for some crunch. I was able to eat in 20min, start to finish (I added chicken to mine) and it turned out so good. Thank you for this recipe! It wont be the last time I make it!! I was wondering if the brand of peanut butter makes a difference? I was going to use Justine’s organic peanut butter but I know in some recipes it doesn’t work very well because it is organic. I was wondering if you had an experience using Justine’s? Hi Ashley! I haven’t tried that particular one, but based on some prev. comments, the natural PBs don’t tend to melt as well. I just used a standard creamy PB. I am going to make this tonight but am using frozen Zoodles and frozen spiraled carrots. They are the kind you steam in the bag. Have you tried this or know if anyone that had luck doing it this way? Thanks!! Hi Trisha! Hmm you could look thru the comments, but nothing comes to mind – sorry! Could you just steam them and cook them for a little less time maybe? Let me know how it goes! Oh my gosh, haven’t made this yet (thought planning on it for later in the week) but HAD to say thanks for the delightful little “courgetti” tidbit! Hi, I made this tonight and it is delicious! I do not own a spirilizer so I used frozen zoodles. I just ended up having to cook it longer to get some of the liquid to evaporate, and that meant my zoodles were extra soggy but the taste was still sooo good. I think tomorrow I will try cooking the zoodles first and then halfway thru THEN add the sauce. Oh and I omitted the siracha cuz I’m a wuss, lol, but still good! Thanks for the frozen zoodle tips! So glad it worked out. I’m a wuss too lol. So good… Added chicken for a little more protein… Definitely a go too for a fast meal! I have picky eaters at my house who don’t like zoodles but the flavors of the sauce sound too lovely not to try, Do you think this would work with whole wheat spaghetti if i heated up the sauce in a separate pan and tossed to coat? I think that could work! I hope they like it! Hello. What zoodle maker do you use? this looks amazing – is it 490 calories total or per serving? can’t wait to try it! Thank you! The calories is for 1 serving, so 1/2 the recipe. Hope you enjoy it, Brittney!